Remember when you were in fourth grade and you would shake all of your presents before you opened them and try to guess what was inside? Well, I’m not sure if this is sad or not, but I know adults who still do that to this day. And it kind of ruins the whole gift giving thing. 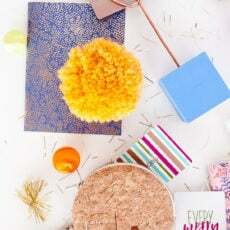 So, I partnered with Gift Card Mall this year to throw all of those holiday ‘gift guessers’ off the scent with an interesting way to wrap gift card pressies. 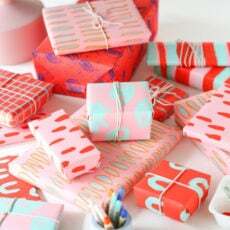 AND I have a DIY wrapping paper idea to share too, that pattern lovers will especially love. You’ll see in the video, I picked up a Sephora gift card for a few of my friends from the Gift Card Mall at my local grocery store. But you can also head to giftcardmall.com to purchase online. There are TONS of brands that you can buy gift cards from too (Amazon, Target, iTunes, Starbucks, Nordstrom… even Visa gift cards). Once you have your gift cards, slip them inside something other than an envelope. I used an record sleeve, a book, and a clutch. But you could also try a bar of chocolate (I like Compartes), a box within a box, a calendar, etc. 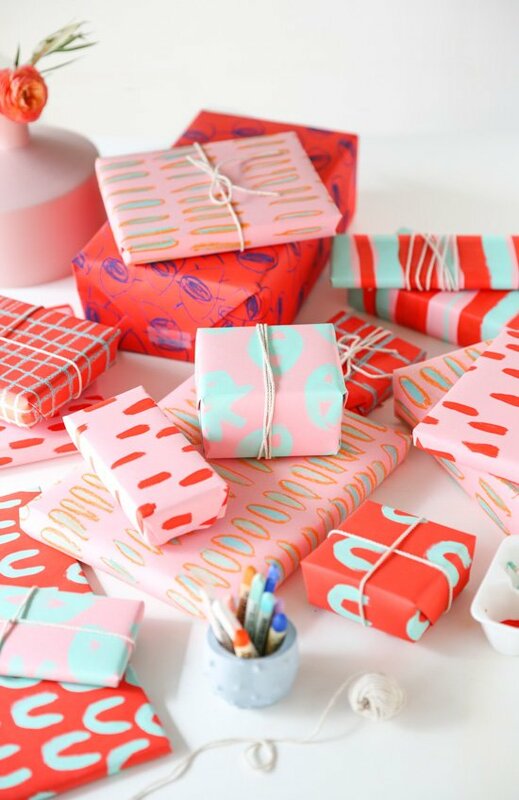 Then wrap your gift with DIY wrapping paper. 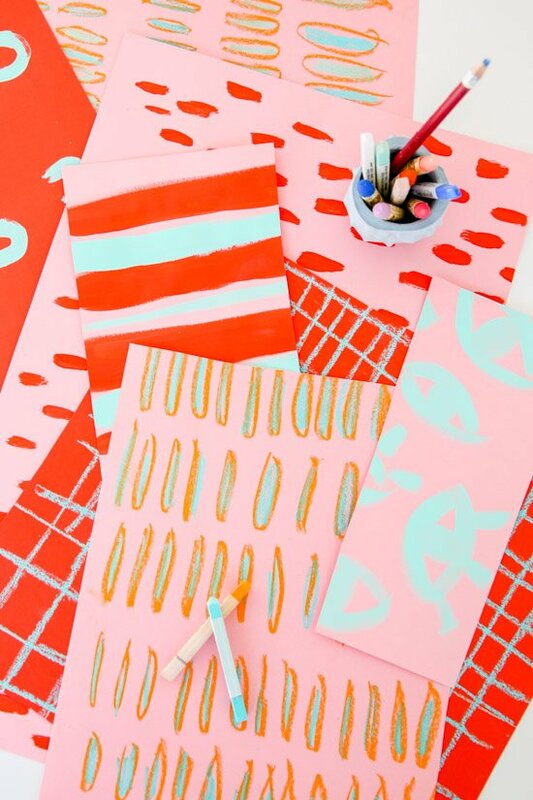 I used colorful craft paper and art supplies (chalk pastels and acrylic paint) to create interesting patterns before wrapping. Tip: If you use chalk pastels, be sure to use a spray fixative (or strong hold hairspray) on the entire design before using the gift wrap. More info on applying fixative in the video above. Now you have an unsuspecting (and awesome) gift for a friend or family member and they no matter how hard they shake your gift they’ll never be able to guess what’s really inside. What do you think of this DIY idea? Think you might give it a try this year? 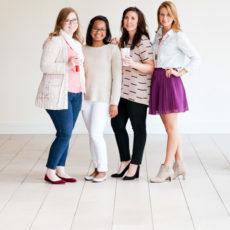 This post is in partnership with Gift Card Mall. 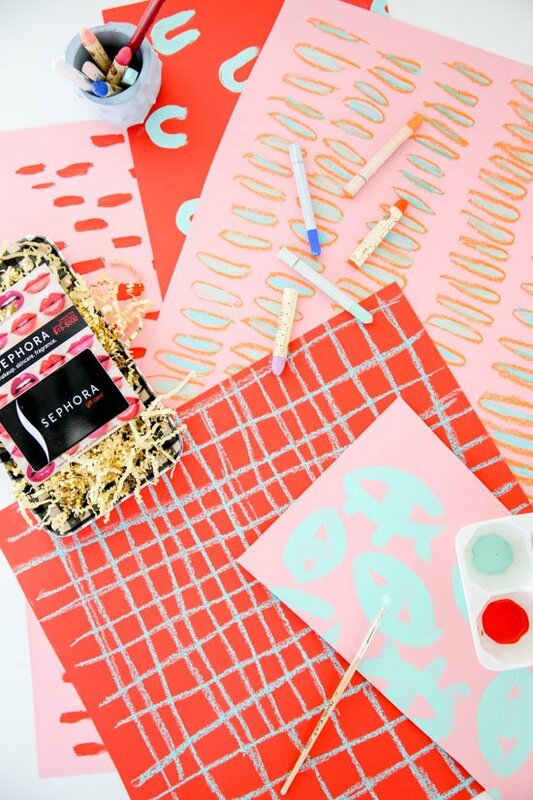 Thank you for supporting the brands that help keep Paper & Stitch running. Happy holidays! This is so cute! 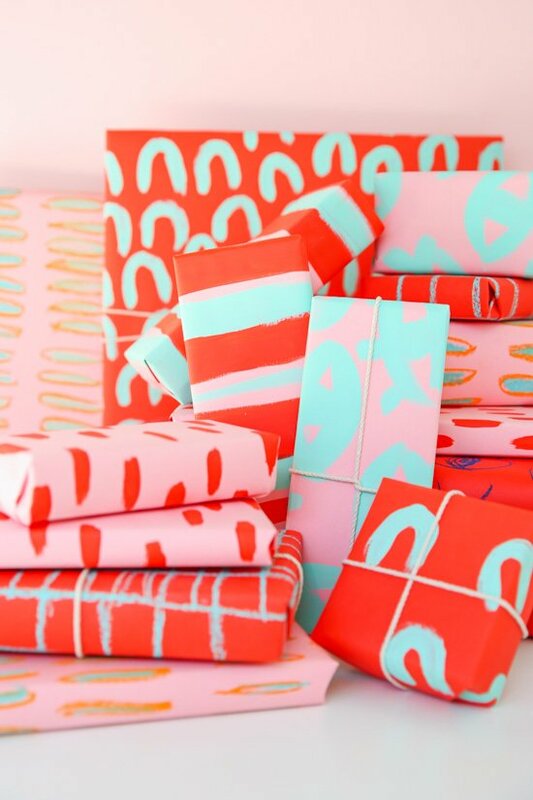 I love your bright gift wrap. That album idea is genius! Seriously. Where did you find a blank album cover or did you cover it yourself? Thanks Kimberly! That is an actual album cover (its all pink and the name of the band s written really tiny on the front, which you couldn’t see in the video). BUT, I think covering an album would be a great option too. I really like the patterns you created, very colourful! Thanks Michelle. I’ve been on a major pattern kick lately. Thanks Fran! Glad you like it. So much cuteness!! I love the colors and patterns! You are so creative! And you’ve got an amazing eye for colour. 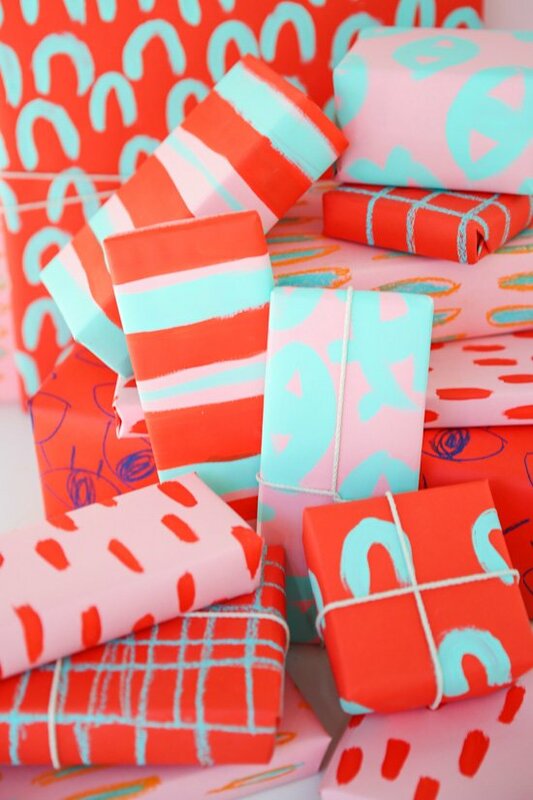 I simply love the photo and the idea of gift wrapping always excites me! Thank you for sharing this! Love this! Where did you get the paper? Do certain kinds work better than others? Thanks! Aw, thanks Lex!!!! 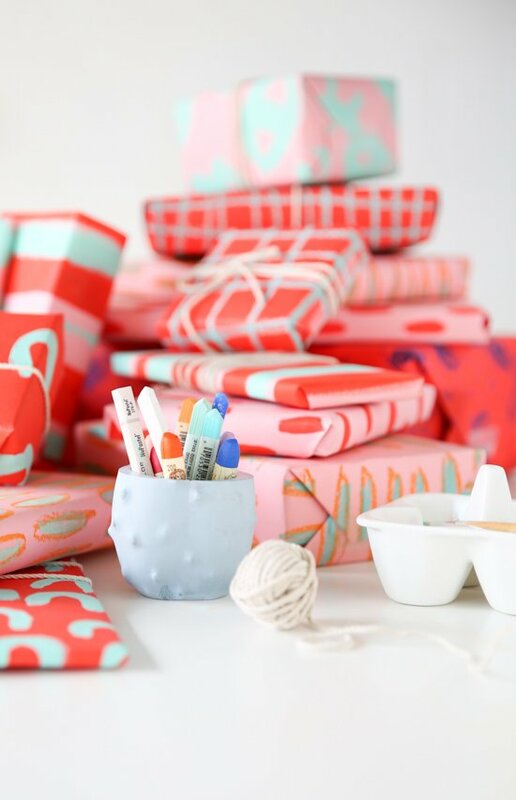 Gah, I would love to come visit and wrap presents. Miss ya. Thanks Catherine. I got the paper from my local art supply store. It was $1.50 per sheet (24×30 size I believe) and comes in lots of colors. 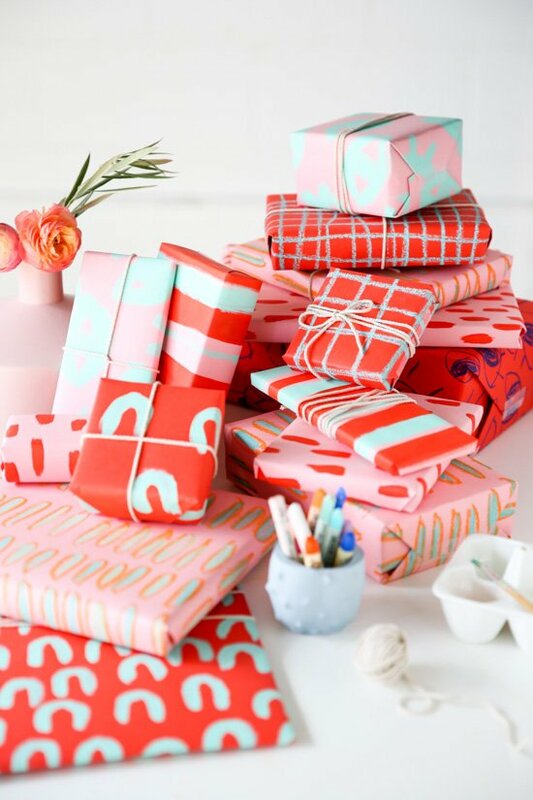 I would recommend using paper that’s a little thicker than normal gift wrap so that it the paint doesn’t wrinkle the paper. Hope that helps.